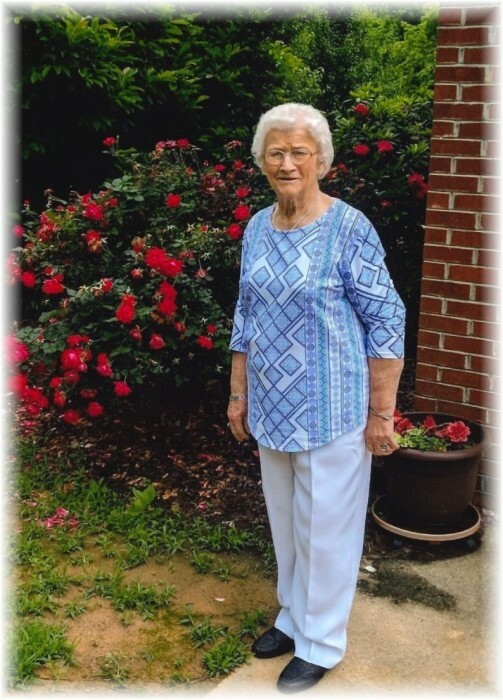 Clentis Rose Phillips Capps, 85, passed away on Monday April 8, 2019. She was born in Johnston County the daughter of the late Repsie Hales Phillips and Melvin Joshua Phillips. Clentis was preceded in death her husband, Noah Capps and by brothers and sisters; Melvin Vernon Phillips, Esther Phillips O’Mara, Sadie Phillips Bissette, and Donald Wayne Phillips. She was a member of the Friendship Freewill Baptist Church in Middlesex. A funeral service will be held at 2 o’clock Thursday afternoon April 11, 2019 at the Friendship Freewill Baptist Church 744 Friendship Church Rd. Middlesex, NC 27557. Entombment will follow in the church cemetery. She is survived by her children, John Capps and wife Lynette of Apex; Barbara Elliott and husband Mark of Zebulon; Cindy Armstrong and husband Jon of Wendell, Loyria Capps and partner Tammy of Fuquay Varina, Melvin Capps and wife Linda of Garner, Noah Capps, Jr. and wife Wendy of Middlesex, grandchildren, Brandon Capps and wife Cindy, Bradley Capps and wife Stephanie, Jessica Elliott, Justin Elliott, Jeremy Elliott and wife Brooke, Elizabeth Armstrong, Rachel Armstrong, Amanda Casper, Adam Casper, Anna Capps and Taylor Capps; great grandchildren, Turner, Allie Grace, Shelby, Joshua, Christian and Levi, sisters and brothers: Sue Phillips Creech, Nelson Eugene Phillips and wife Sue, Linda Faye Phillips Blackley and husband Wayne, Joseph Hillary Phillips and wife Linda, Percy Lee Phillips and wife Rebecca, and close friend and companion Katie Strickland. Memorial contributions can be made to the Friendship Freewill Baptist Church 744 Friendship Church Rd. Middlesex, NC 27557 or to the SECU Hospice of Smithfield 426 Hospital Rd. Smithfield, NC 27577. Friends may visit with the family from 12:30 – 1:45 Thursday afternoon prior to the service in the church fellowship building.